BROSSARD, Que. — The Montreal Canadiens like the way their lines are clicking early in the NHL season, so head coach Claude Julien says to expect more of the same for their home opener Thursday night against the Los Angeles Kings. "We're not changing our style of play. It's not on us to adjust to other teams," Julien said Wednesday. "We'll adapt at some small things, but our style of play won't change." 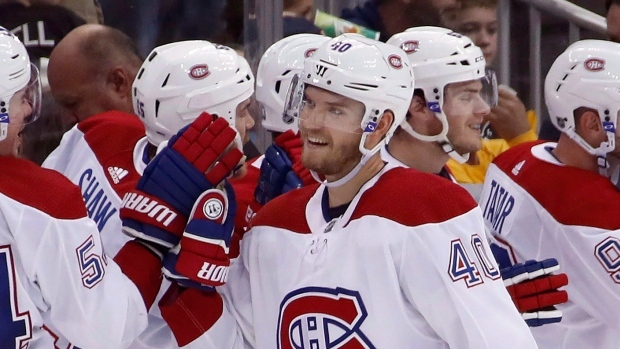 Montreal's quickness through its balanced forward lines stood out over its first two games. The Canadiens (1-0-1) rolled out the same four lines for their first two games of the season to some success; a 3-2 overtime loss to the high-scoring Maple Leafs in their season opener and a 5-1 blowout win over the Pittsburgh Penguins on Saturday. "I really enjoy having the same line," said Canadiens winger Brendan Gallagher, who played the first two games with newcomer Tomas Tatar and Phillip Danault on his line. "I always find that two, three games into playing with each other. That's when the chemistry starts to build and you start to grow. Things just start to happen naturally without thinking." If this week's practices are any indication, it seems Julien is content with the roster he's been deploying. That leaves youngsters Jacob de la Rose and Nikita Scherbak and veterans Tomas Plekanec and Karl Alzner out of the action, though Julien said there is no hard feelings form the scratches. "They're giving me a reason to feel really comfortable when that day comes, that I decide to put one in, that they'll be ready to play," Julien said. "I think the guys that haven't played have had a great attitude. They're supportive of their teammates. They're also working hard because they want to be part of that playing group. I think right now we've got some good inner competition, but it's a healthy one." Julien knows a decision may have to be made with de la Rose and Scherbak, younger players itching for an opportunity to get back in the lineup. The two can also contribute to the team's American Hockey League affiliate in Laval, Que., but would have to clear waivers to get there. "I'm one of those coaches that looks at what group of guys will form the best team," Julien said. "At one point we're going to have to face the music here and make those decisions. It's coming, and it's coming pretty soon." Meanwhile, the players have responded well to the lack of tinkering. "That's good that I have the same guys on my line," rookie Jesperi Kotkaniemi said post-practice. "We're getting comfortable with each other, we're starting to know each other a little." Added centre Max Domi: "It's still early, right? You're building chemistry with everyone on the team, not just your linemates. We're liking the chemistry we have with our units. So we'll keep rolling with it." The Habs hope their style of play can be effective against a bigger Los Angeles squad Thursday. The Kings (1-1-1) are part way through a four-game Canadian road trip and dropped a 2-1 decision against the Winnipeg Jets on Tuesday night. NOTES: Julien said forward Nicolas Deslauriers is "two weeks, at the most" away from returning to the team. The forward has been out indefinitely since suffering a facial fracture during a pre-season fight against the New Jersey Devils Sept. 17 ... The Canadiens will be commemorating the 25th anniversary of their 1993 Stanley Cup winning team during their home opener Thursday night. The Canadiens captured their league-leading 24th Stanley Cup in a five-game series win over the Kings.